Send us a picture of your teardrop and we will add you to our photo album! I really love small campers. The classic teardrop campers of many moons ago still travel the open road. We have lots of parts for teardrop camper enthusiasts. We also have lots of stories too! Below find information and articles about creating a good teardrop camping setup for you and your family! Solar Panel in a teardrop camper. 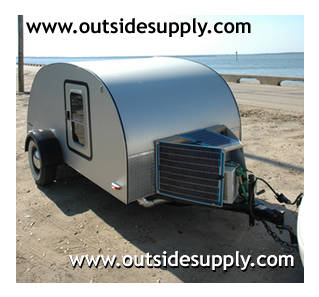 Many customer choose not to install their solar panel on their teardrop camper. instead they choose to make it portable. Stowe it when traveling and set it up when camping. This has provided a great setup for many smaller campers without as much rigid framing to mount the panel. A clean solar panel portable install often includes a set of quick connect cables that will connect to a panel cable set. We carry all of the setup cables and are glad to get you the cables you will need for your portable solar panel kit in your teardrop. In fact many users can have their solar panel setup and operating in under two minutes. Here are a few pics of us taking a camping trip to Percy Quinn in Mississippi. This a great State park and there lots of spots. I didn't see any other teardrops but did see one on the way. How much Solar do I need for my RV? My travel trailer is prewired for Solar, now what? Are lithium batteries a good choice for solar? Can I use a 24 volt panel with GP-PWM-30 charge controller? Free Shipping on All Power Inverters? How many batteries does an RV need to last all night?